As this post publishes, Mayor Antonio Villaraigosa, Inglewood Mayor James Butts and NASA Administrator Charles Bolden are speaking at the private, invite-only opening ceremony of the Space Shuttle Endeavour Exhibit as will a dance choreographed by Debbie Allen be performed. And at 11 AM, the shuttle will open to the public for viewing, as well as its adjacent exhibit, Endeavour: The California Story. I was lucky enough to get invited to a pre-opening reception last night where we started off with some drinks and bites at the Mixing Room inside the JW Marriott. 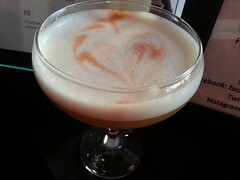 My personal favorite was the “20” – made, of course, with Plantation 20th Anniversary Rum, lime juice, honey and egg whites. Delicious Kobe beef “Solar” sliders, arancini “Meteorites” and curry chips with hummus lined our stomachs before we shuttled on over to the California Science Center for a viewing – so long as we promised to waited until now to hold off on social media regarding the historic shuttle. 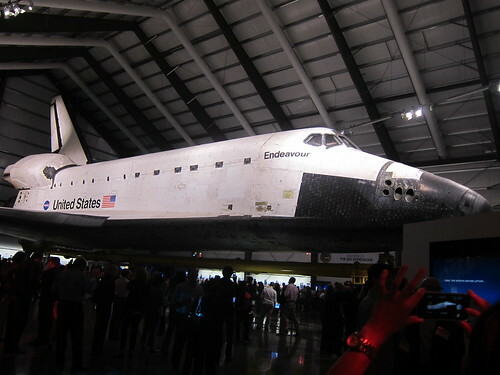 In the exhibit (Endeavour: The California Story) leading up to the actual shuttle, you’ll learn about all NASA missions leading up to, including and succeeding the Endeavour’s, as well as the space program’s extensive ties to Los Angeles from Palmdale to Pasadena. See a shuttle potty, set of wheels, and a replica Mission Control station amongst other things. Get inside one of two Endeavour simulator pods for a first-hand perspective. See the time lapse video of the shuttle’s journey through LA on the big screen. But it goes without saying that the shuttle itself, having traveled 122 million miles in all, is breathtaking once you see it up close. The texture of the shuttle is made of countless tiles which are each coded and constructed to withstand unfathomable degrees of heat depending upon its location on the structure. And bring a wide-angle lens if you have a fancy DSLR so you can get the entire wingspan in one shot (see above). In case you wondered, for an American shuttle, why NASA adopted the English spelling (neighbor vs. neighbour), there are historical reasons. Apparently, the shuttle itself is named after the HM Bark Endeavour, commissioned by King George III, which carried out the British expedition into the South Pacific in order to track the passage of Venus between Earth and the sun all the way back in 1769. Without further ado, peep my pictures of the exhibit and Space Shuttle Endeavour from the pre-opening reception below. And don’t forget to reserve your tickets. Your best bet is weekday nights or early morning on the weekends. Go Metro: Expo Line to Expo Park/USC Station. The Science Center is located 0.2 mi away, on the south side of the Rose Garden. This entry was posted in Central L.A., Downtown LA, Events, South LA and tagged @jwlalive, Antonio Villaraigosa, California Science Center, Discover LA, DTLA, Endeavour, exhibit, Expo Line, Go Metro, Inglewood, JW Marriott, LA Live, Mixing Room, Samuel Oschin Air and Science Center, Samuel Oschin Air and Science Center Display Pavilion, South LA, space shuttle. Bookmark the permalink.